Fiona is our classroom fairy. She visits every so often, leaving us notes and surprises. Fiona made herself known one fall day when the kids in the class noticed our fairy door on the wall. The next day there was a letter waiting. The kids write her notes, leave her presents and celebrate the magic that is Fiona. Every single kid buys in to the fantasy play that our fairy brings. She begins her visits each year once the kids notice the fairy door, and classes talk about her from years past. I love it. Today when the kids arrived, Fiona had made our play stand into a magical fairy garden. There was an invitation to play with the fairy stones, the glitter, the natural objects and the books and writing paper that Fiona left us. 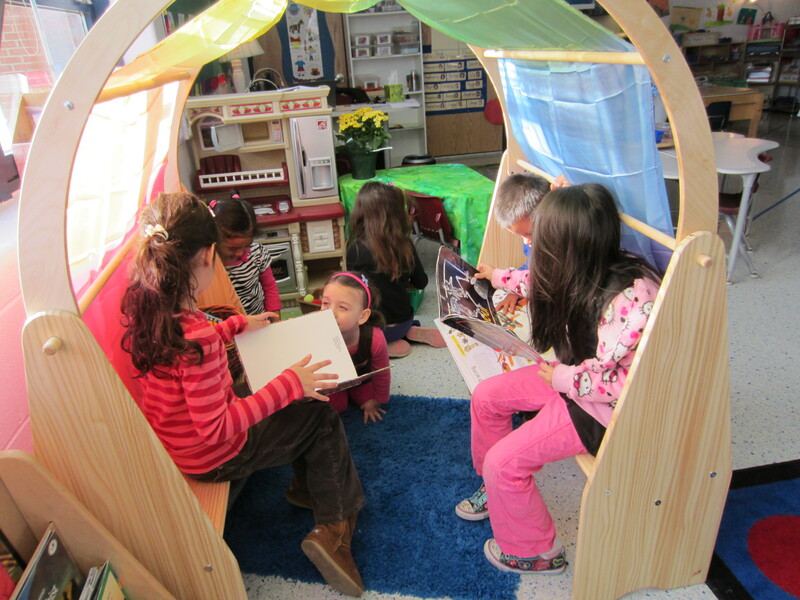 It’s another space in our classroom where kids can go and play and imagine that Fiona is real. She becomes their confidant, their friend, their imaginary player in our kindergarten classroom. She provides another path to creating narratives, solving problems, inventing situations and seeking meaning in a five year old’s world. The play is filled with talk and imagination, literacy, wonder and joy. It’s truly as magical as Fiona.